A longtime dispute between two elderly Germantown politicians erupted into a raucous, fiery confrontation at the McDonald’s restaurant on Mequon Road, the Milwaukee Journal Sentinel reported today. Former village trustee William Steitz, 62, and trustee Michael Bech, 70, drew the disapproval of the restaurant manager and warnings from the Washington County Sheriff’s office. On the morning of January 27, Steitz, the apparent instigator, reportedly confronted the older Bech concerning a year-old political dispute as Bech hobbled into the fast food joint. While no blows were exchanged, heated words were bandied about liberally. Words like “Liar!” “Hooligan!” and “Shenanigans!” were allegedly heard all the way from the golden arches in front to the dumpsters in the back lot. Afterward, Steitz declared he felt no need to apologize for his behavior. 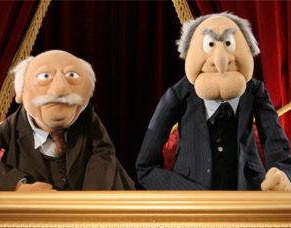 Bech did apologize to the community and said he will no longer share balcony seats with Steitz at puppet shows. While Bech is not seeking re-election in April, Steitz will be running for a trustee seat. The Village of Germantown lies on the wild, western border of Mequon and the barbarous behavior of their politicians often raises concern at the Mequon Defense Department. Next articleMEQUON WINTER WEATHER ADVISORY!